This is my MIL’s method of making seppankizhangu poriyal for rice. Sepan kizhangu is known as Colocasia or Taro root in English, Arbi in Hindi, Kesavuna gedde in Kannada, Chamagadda in Telugu.As its a healthy vegetable, we try to include this in our diet very often. 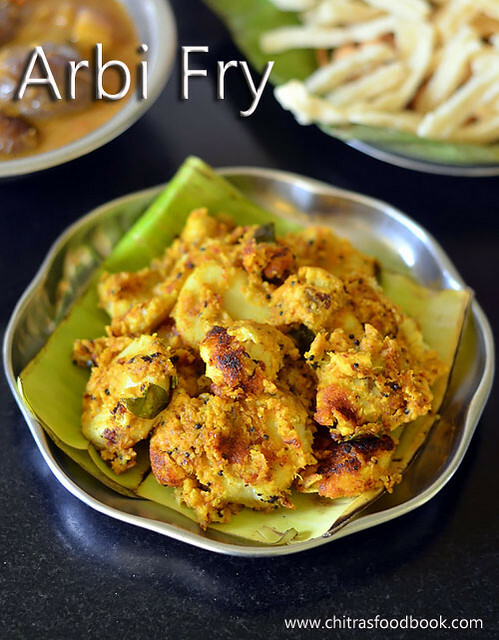 Usually I make South Indian style arbi fry with or without coconut or add in gravy/kuzhambu. 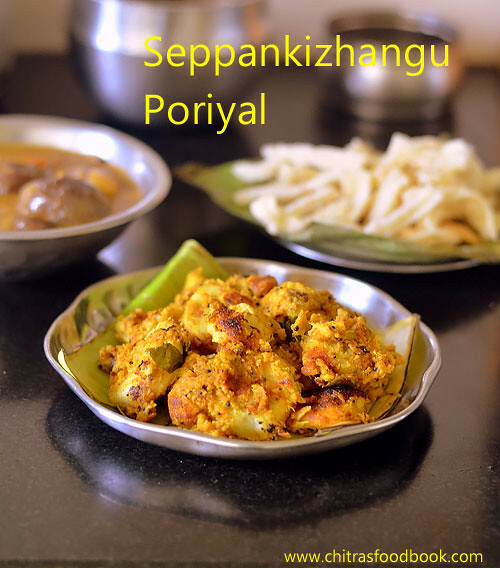 Today I have shared our version of seppankilangu poriyal with coconut & onion masala.It is a good side dish for sambar & mor kuzhambu. Soon I will share my seppankizhangu roast recipe without coconut. Now lets see how to make this yummy seppang kilangu poriyal with coconut. Wash the arbi, remove the mud if any.Pressure cook in very low flame for 2 whistles adding enough water. Remove and peel the skin. Chop into thick slices. Set aside. In a mixie jar, grind all the ingredients given under “To grind” to a slightly coarse paste without adding water. 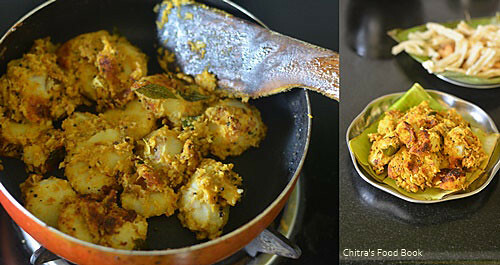 Take the sliced arbi in a plate.Add the ground coconut masala, mix well and check for taste. Add more sambar powder or salt if needed. Heat oil in a kadai splutter mustard seeds, curry leaves.Add the masala coated arbi and mix well. Keep the flame low to medium. Mix till the raw smell of masala goes off. Remove when the arbi gets roasted well with a nice smell. 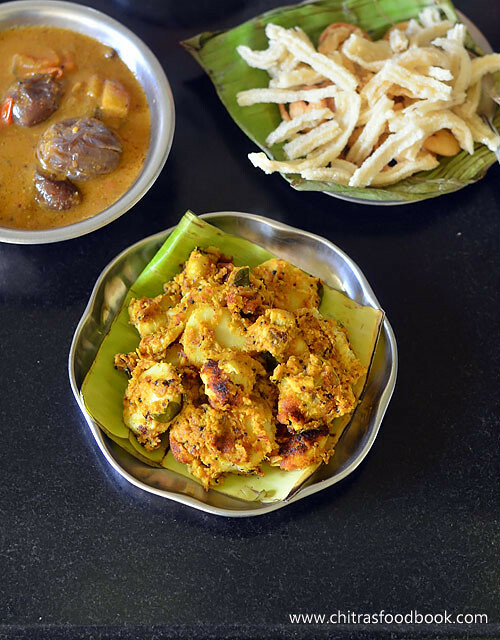 Serve with sambar rice, rasam or mor kuzhambu. Tastes yumm ! You can use potato or tapioca instead of arbi and make the same way. Tamarind is used to reduce the itchy feeling of this vegetable. U can skip if you wish. If you want you can replace sambar powder with 1 tsp red chilli powder and 1 tsp dhania powder. 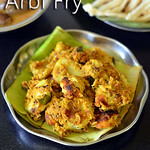 Arbi fry is tasty food with chapati and rice. I tries it once.